This post is part of the throwback series posts on some of the key discussions regarding IoT development and plans in the region in 2018 that was shared in our Keynote Session at the 20th edition of Asia IoT Business Platform (AIBP) in Singapore early this year. For this second post, I will share with you about Malaysia (you can view my first post on Indonesia through this link: IoT Development in Indonesia). In this regional gathering in Singapore, Malaysia was represented by Tuan Haji Aisharuddin bin Nuruddin, Senior Director for Technology and Society Division, Malaysian Communications and Multimedia Commission (MCMC). MCMC is a regulatory agency responsible to implement and promote Malaysian government's key policies for the communication and multimedia sector and to oversee new regulatory frameworks. 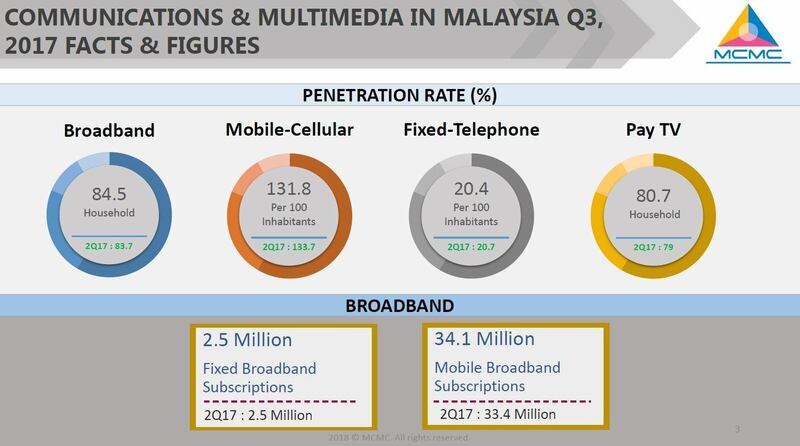 Malaysia is fairly mature in the region in terms of ICT development with internet penetration of 78.3% and according to Tuan Haji Aisharuddin, mobile cellular penetration of 131.8% - refer to the figure below for more details. This provides a good foundation to further drive the digitalisation and IoT adoption in the country. Under this 11th Malaysia Plan and the KPIs, Malaysia is expected to fulfill its targeted GDP growth rate of 5.1%. Digital transformation and the adoption of IoT technologies will be key to unlocking future potential growth. With IoT growing to be an integral part of the digital economy, agriculture, healthcare, manufacturing and transportation are sectors that are identified to have the most potential for IoT deployment. In driving digital transformation in Malaysia, Tuan Haji Aisharuddin approached it through 2 main angles: framework development and industrial development initiative. Several important frameworks have been introduced by Malaysia throughout the years in her effort to drive digital transformation. IoT is a part of Smart Cities Framework introduced in 2016 which focuses on standardisation and ICT layers. 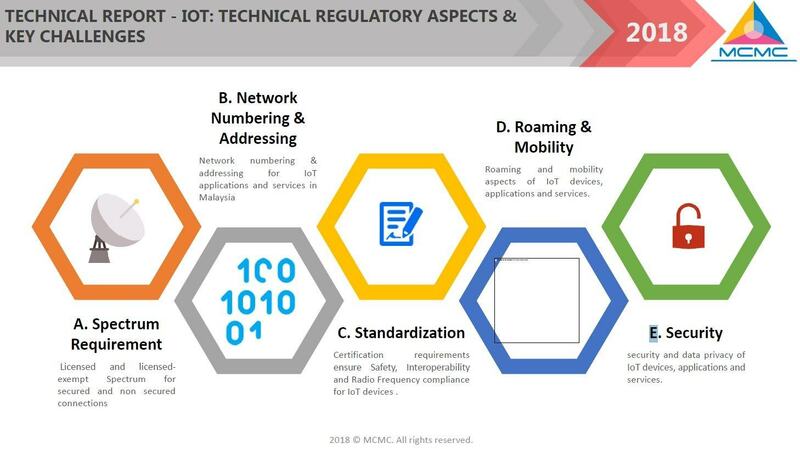 In 2017, MCMC introduced Electromagnetic Field Emission Guideline which provides a guideline for advancement of cellular technology including 5G and IoT networks. Aside from the regulatory framework, the Malaysian government also pushed several industry initiatives including Digital Lifestyle Malaysia initiative. This initiative was introduced to provide a better quality of life for Malaysian citizens through the use of ICT and IoT applications. Tuan Haji Aisharuddin also stated that with the development and adoption of ICT and IoT, the government aims to enhance the competitiveness of Malaysian enterprises and SMEs in the regional and global stage. Under this initiative, there are 6 main sub-sectors: Track & Trace, Healthcare, Retail & Payment, Transportation, Agriculture and My Maker. Projects have been pursued in Malaysia for each of these sectors. 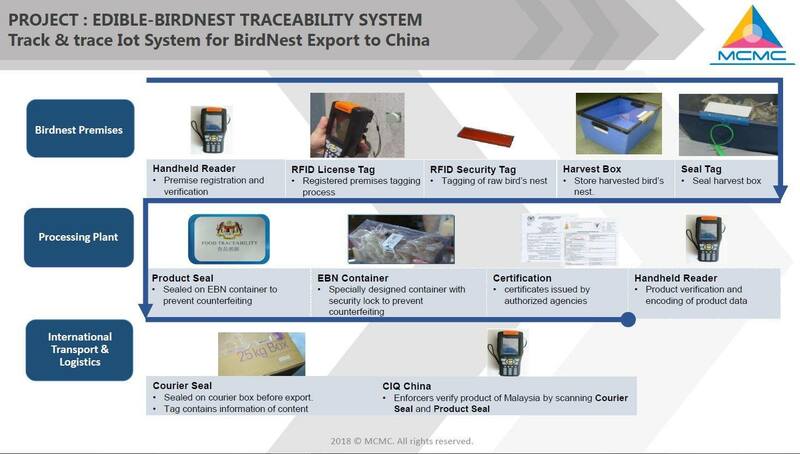 One of the examples presented was bird's nest traceability project. An IoT system, including through the use of seal tag and RFID, has been implemented in Malaysia to trace bird's nest products throughout the entire supply chain to ensure the quality and safety of the products, especially those being exported to China. Tuan Haji Aisharuddin highlighted the importance of ecosystem through My Maker initiative. My Maker is an initiative by MCMC, maker communities and industries to create a platform for IoT stakeholders to come in together and brainstorm novel IoT solutions and applications. Roadshows have also been organised across Malaysia through My Maker to promote the importance of IoT and grow the ecosystem. The Malaysian government has also recently launched their Industry 4.0 initiative called 'Industry4WRD' which focuses on driving digitisation of local manufacturing companies. Through this initiative, the government hopes to solve several business concerns including workforce management such as health and safety, waste management, and operational efficiency and productivity. Under this initiative, the government has allocated billions of ringgit to incentivise local enterprises and SMEs to explore and adopt frontier technologies. We will be hosting a regional gathering in Singapore, the 28th edition of Asia IoT Business Platform, on the 15th January 2019 where ASEAN governments and key enterprises will be involved. Dr. Karl Ng, Director of Data Economy, Malaysia Digital Economy Corporation will be sharing further on the Malaysian government's latest initiatives and the current landscape of enterprise IoT and digitalisation in Malaysia.